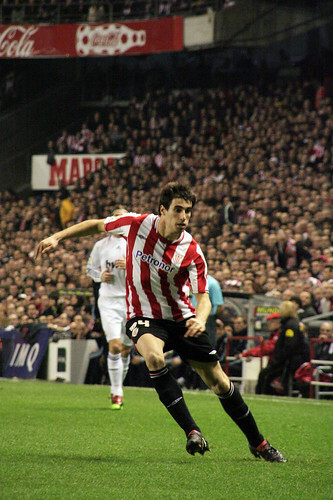 Having been strongly linked with a potential move to Barcelona, Athletic Bilbao’s midfielder, Javi Martinez remain calmed and doesn’t want to take the rumors seriously at least for the time being. Martinez, who is still under contract until 2016 doesn’t really buy the speculation saying that Barca are willing to pay the exact amount of his buy out clause which worth around 40 million Euro, obviously a pretty high cash even for the Catalan outfit. Martinez modestly think that he himself is not worth that kind of money, so that’s why the midfielder simply isn’t taking the rumors into serious consideration and chose to simply focus on playing well for his team. However, the 23-years-old does admitted that his actually felt honored being talked about in the press so much, especially being linked with a big club such as Barcelona, which kinda made him felt like a very special player. “I do not think there’s anyone who wants to pay so much for me. I see it as too much money for me. I do not think I’m worth so much; I do not think that I’m worth €40m. Although it is very nice to be talked about in the newspapers; it is a product of what you are doing and says you’re doing things right. I am very happy to talk about myself but now I’m very focused on what I have at the moment. That is enough, so I will try not to give much attention to that [the speculation],” Martinez told Mundo Deportivo. The 23-years-old midfielder has been catching the eye of several top clubs after his excellent performance in the European under 21 tournament not long ago and his consistent performance with Bilbao up till now. Among the interested suitors, the press believed that Barcelona are the most serious team as they are looking for a potential replacement for Seydou Keita, who could very well move from the Catalan team next summer. Martinez’s playing style and character undoubtedly will suit Barcelona’s playing style, but just like the player’s statement, it’s a bit difficult to believe that there’s a real move for the player next summer considering his clause and unclarity in the Barca’s coaching department. The midfielder might be more keen on staying for at least one more season with Bilbao especially if Marcelo Bielsa’s team can finish in the top four by the end of season, which means that the Basque outfit are set to play in the Champions League.